Consumption challenge update: Simple changes cut my water bill in half!!! 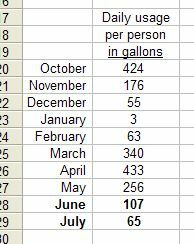 Our new water bill just arrived, so I thought it’s a good time to weigh in on the water component of the summertime consumption challenge. I’m surprised and excited to report that we have reduced our water usage by two-thirds and cut our bill in half when compared to the previous few months. Sounds like we cheated right? The two changes that likely most affected the decline were 1) replacing a leaky sprinkler valve, and 2) fixing a leaky toilet. Meet your meter. Find the lid, pop it off, and with everything in your house off, check to see if it’s running. If it is, you know you have an issue. If you suspect something odd, call your utility company. I did this and was surprised at how helpful they actually were. They checked the meter for me free of charge, and have offered a refund when I show them documentation that I fixed my leak. Seek out high bang-for-your-buck changes. No matter how short a shower I took, I would never have dented my overall consumption without fixing my leaky toilet. Focus on fixing the most egregious water wasters, like overwatering your lawn, and you’ll see a bigger change than with other habits. Heating and cooling makes up more than half of a typical home utility bill. A high-impact, low-cost way of making cool air last longer is through insulation. A well-insulated home’s utility bills can be 30% lower than those without. Most homes aren’t well-insulated — 80% of those built before 1980 have less than the recommended level of insulation, according to the U.S. Department of Energy. Here in Texas where the sun beats down on the roof and elevates attic temperatures, making sure the attic is well-insulated has a great impact on A/C usage. How much insulation should I have? Where I live I’m supposed to have R49 in the attic. How do I know the level of attic insulation I have now? If you have an unfinished attic with an access door you can pop up into, take a ruler and a flashlight and make note of what you see. Here’s a link to a chart that you can check to find out what you have in your attic. I have about 5 inches of blown-in fiberglass insulation, which equals about R15. An interesting rule of thumb is that to get to R38, which is recommended for a lot of people, it would take 10-15 inches of insulation, depending on the type. Subtract the R-value you determined you have from your recommended R-value, and that will give you the amount it would make sense for you to consider adding. There are several approaches to adding insulation. You can hire someone to do it, which will cost from 25 cents to $1 or so per square foot installed, depending on the amount and type added, or you can do it yourself. Home centers sell the blow-in cellulose kind for $6-7 per bag. The R-value you get out of a bag depends on how thickly you blow it in. At R13 thickness, one bag covers 40 square feet. Thus, for my 2000 square foot home, adding R13 insulation would require 50 bags. When you buy more than 20 bags, the home center will rent you the blower for free. IMG_0063, originally uploaded by espeedy123. If you were wearing an Armani suit, would you wear a clip-on tie? If you bought an super hi-tech HDTV, would you hook it up to your old VCR? Likewise, if you spent a small fortune installing a fancy front door, would you adhere brown sticky foam around the perimeter of the edge of it to seal out air? 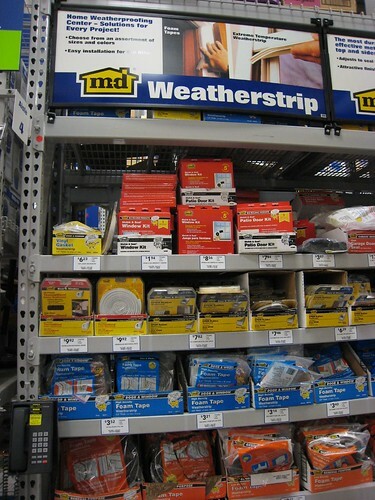 Thus the hot topic for today — the Hands On discussion of options for weather stripping your exterior doors. OK so maybe I’m a snob. I encourage you to comment and tell me as much. I just know that I’ve priced a lot of doors lately for the flip house, and I own a pretty decent (if neglected) front door. I know how much they cost, and I just can’t get into that foam. And the foam stuff is what I keep seeing energy experts talk about. I know I need weatherstripping. I don’t need a blower door test to tell me. I can feel a bit of air around the door, and in a couple spots I can see sunlight. And according to Lowe’s, a 1/8″ space around an exterior door is equivalent to a 2×2 inch hole in the wall! I visited the two major big box hardware stores and found foam and some vinyl. I think this is perhaps one of those items you might need to shop for elsewhere. I checked a premium hardware store here in Dallas called Elliot’s, and a roll of brass flashing long enough to go around my door was just under $20. rain barrel story, originally uploaded by espeedy123. 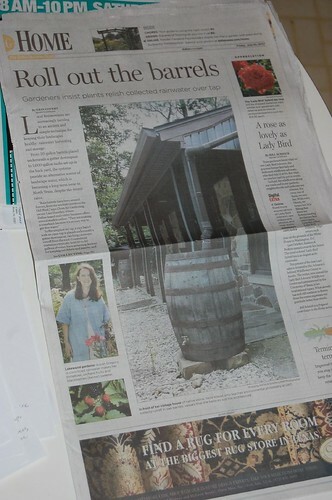 Check out my story on rain harvesting in today’s Dallas Morning News. Complete with Spanish language music. fixing the sprinkler valve, originally uploaded by espeedy123. But sometimes, it’s easier and better to hand a project off to someone who knows what they’re doing. One example? Sprinkler repair. 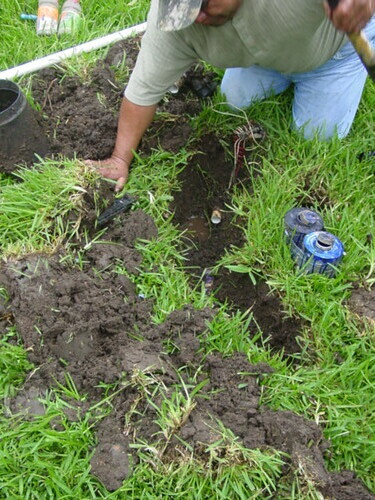 I would advise anyone who thinks they have a problem with their automatic irrigation system to hire a professional to repair it. I knew a couple weeks ago I had a slow leak on my property, and I suspected the sprinkler. Near a couple heads on the side of the house the ground seemed wetter than it should be, but it was tough to tell given the 45 straight days of rain we’ve had. I logged onto my favorite referral site Angieslist and found a popular company called Billy Jack to come take a look. The repair guy diagnosed my problem immediately, and it wasn’t what I thought. Knowing as little as I did about sprinklers, I figured maybe the head was broken or a pipe busted near the head. Turns out the problem was a broken valve 50 feet from the head itself. Unless you installed your system, you may possibly have trouble even locating where some of the parts are you need to fix. My system has 10 zones, and for each zone there is a separate valve, buried in the ground and covered with a round plastic cap. My thick St. Augustine turf had completely obscured these — I never even knew they were there. To find them, the repair guys put some sort of electrical meter in the ground, and used headsets to somehow detect valve locations. Not very DIY. The system involves water and electricity. A dangerous mix! An electrical current is required to open and close valves. The repairers knew where to cut it off. I didn’t. Do you really want to dig a bunch of holes in hundred degree heat? OK so this isn’t a very positive DIY attitude, but it is true. Why waste time digging holes when you could spend time on other more fulfilling DIY tasks! It’s a pretty simple idea, but I think it’s an effective way to start breaking down a really complex problem — how do we go about consuming less? Raise the thermostat one degree. 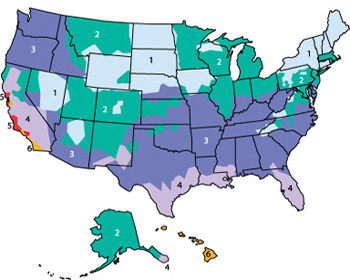 Over half of most home energy costs during summer go toward cooling. Raising the thermostat one degree can result in significant savings, some say up to 10%, on your overall energy costs. Only do full loads. The average American family of four washes 540 loads a year, which consumes up to 21,000 gallons of water. The average family also does more than 150 dishwasher loads annually, which uses about 1,500 gallons. Doing two fewer laundry loads a weekand one fewer dish load a week could save 4,500 gallons of water/year.